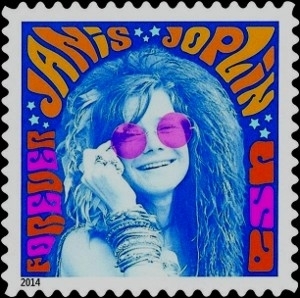 Groundbreaking singer Janis Joplin (1943-1970), an icon of the 1960s whose bluesy voice propelled her to the pinnacle of rock stardom, appears on this stamp in the Music Icons series. Joplin broke onto the national music scene with an explosive performance at the Monterey Pop Festival in 1967. Known for her rebellious public persona, Joplin roared and wailed her way through uninhibited, soulful performances. Her time at the top, however, was brief. She recorded three hit albums and performed at Woodstock, but in October 1970, just three years after she became a star, she died at the age of 27 of a drug overdose. The album she was recording at the time of her death, Pearl, went on to cement her reputation as one of the greatest rock singers of all time. “Me and Bobby McGee,” written by Kris Kristofferson, became a number one hit.